Smart voice assistants are slowly, but steadily getting ingrained into our daily lives, and that isn’t surprising given how fast these magical pieces of code have evolved. Their proponents, which included biggies like Amazon and Google, are constantly finding new ways and form factors in an attempt to get them entrenched deeper into our lifestyles. Amazon for instance, unveiled a bunch of new Alexa-powered devices in the US just a few months ago, and apart from updated models of the Echo Dot and Echo Plus smart speakers, the lineup includes stuff like an Echo Wall Clock and even a microwave. Alexa is also trying to make a place for itself in your car, thanks to the new Echo Auto. Clearly, Amazon’s frisky voice assistant is clearly not shy of venturing into new places. And now, it’s aiming for the speaker or home theatre you already have at home. Say hello (or Alexa) to the new Amazon Echo Input. 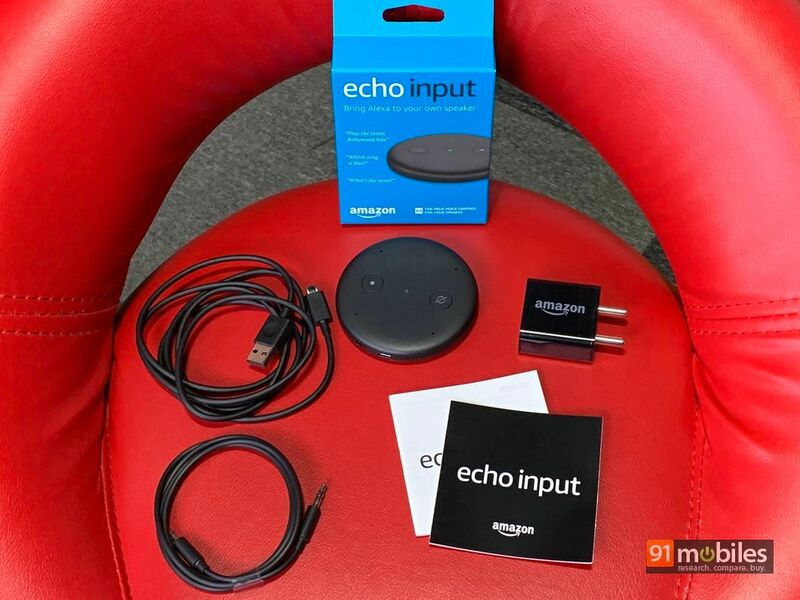 The Echo Input was first announced back in September last year, alongside the other gadgets I mentioned earlier. The Input sits at the bottom of the pile as far as Amazon’s Echo lineup is concerned, and is a tiny, puck-shaped device with the sole purpose of adding Alexa smarts to a dumb speaker or home theatre setup. 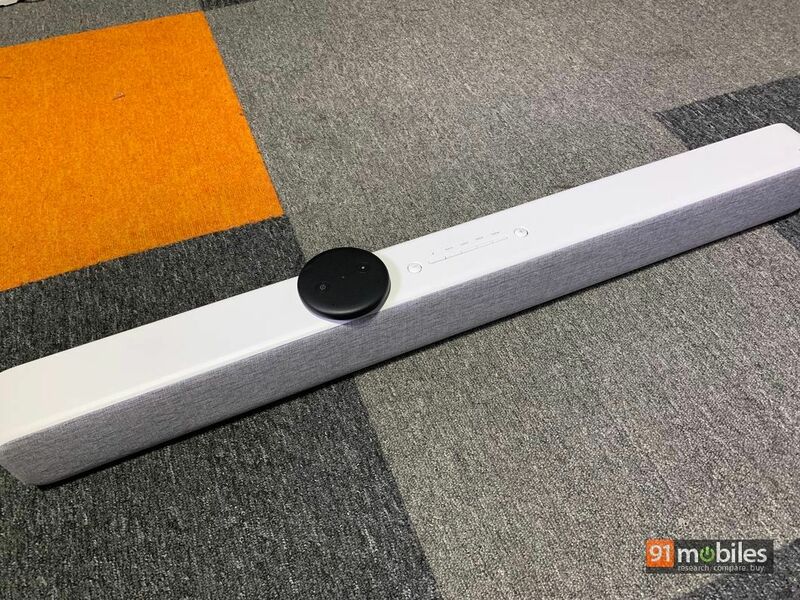 In that sense, the Echo Input mimics the functionality of Amazon’s smart speakers like the Echo Dot, Echo, and Echo Plus… since these devices can also be hooked up to other speakers via Bluetooth or line-in. However, unlike these, the Input doesn’t have a built-in speaker at all. The Echo Input sports a manual Alexa button and a mute key on top, along with four directional microphones and an LED. On the side is a 3.5mm audio line out socket, and a micro-USB port for power. The retail box includes a wall adapter and a micro-USB cable, plus an aux-in cable as well, which is the quickest way for you to hook up the device to your speaker. 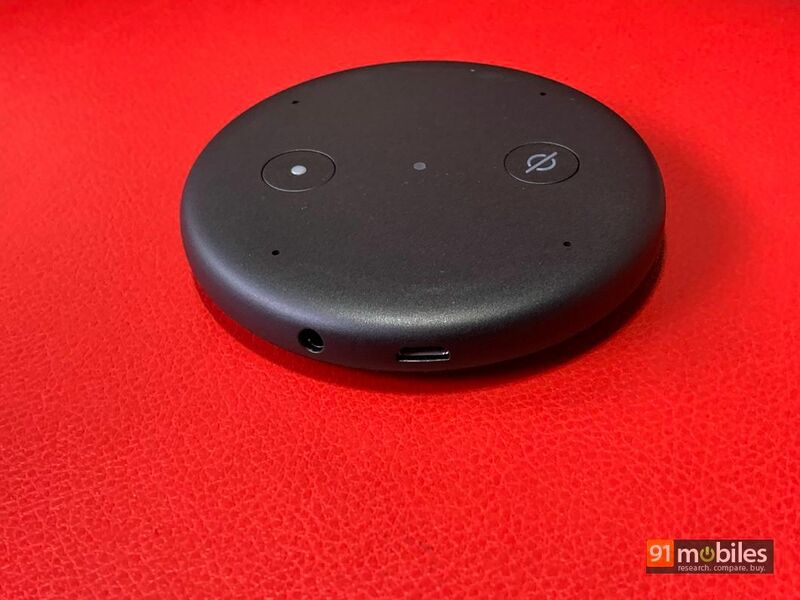 And since the Echo Input also features Bluetooth, you also have the option of connecting it with a Bluetooth-enabled speaker via the Alexa app. The Alexa app, as usual, is needed for setting up the Input and pairing it up with your home Wi-Fi. Just power up the Input, launch the Alexa app, and follow the process of adding a new Echo device to your Amazon account. You’d need to enter your Wi-Fi password when prompted, and the app will also ask you whether you want to connect the Input to your speaker via line-out or Bluetooth. Of course, you can always go back into the app in case you want to pair the Echo Input to a different speaker. Once the Input is connected to Wi-Fi and to a speaker (via aux-in or Bluetooth), your dumb speaker transforms into an Alexa-powered smarty. Then you can go ahead and converse with Alexa in the usual way, asking her about anything under the sun. You can ask her about the weather, make voice searches, add stuff to your shopping list, make calls over the web, perform web searches, shop via your Amazon account or launch any of the thousands of Alexa skills available. The primary use case for the Echo Input would still be music I think, and as usual, you can ask her to play music from Amazon Music, TuneIn or Saavn. The audio quality, in the case of the Echo Input, is obviously dependent on the speaker it’s connected to. Now I won’t get into everything Alexa can do for you, but suffice it to say that you’re better off with her in your life. Did I mention you can use Alexa to control compatible smart home gadgets like bulbs, plugs and other stuff using voice too? Also worth mentioning is the fact that the speaker connected to the Echo Input can be made a part of a new or existing multi-room music setup, in case you have other Alexa-capable speakers at home. 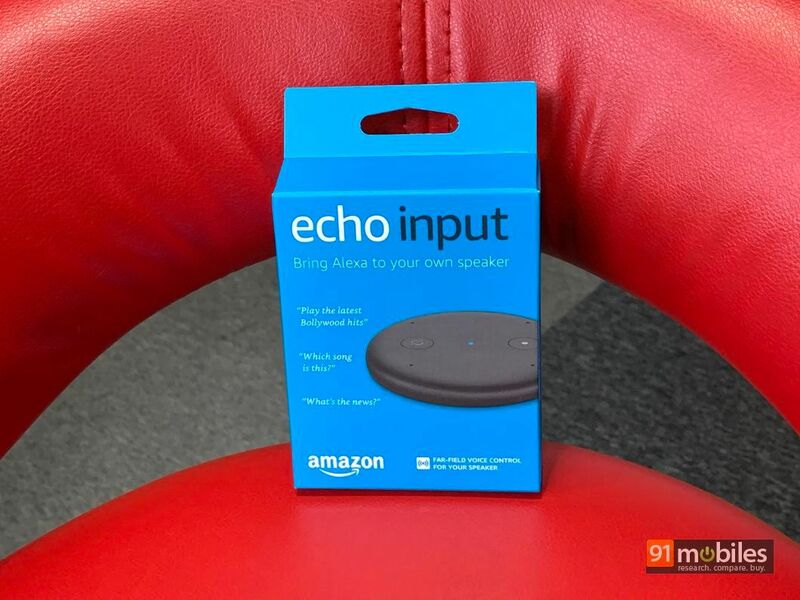 The Echo Input, priced at Rs 2,999 on Amazon India, costs lower than the Echo Dot 3rd-gem, which will set you back by Rs 4,499. 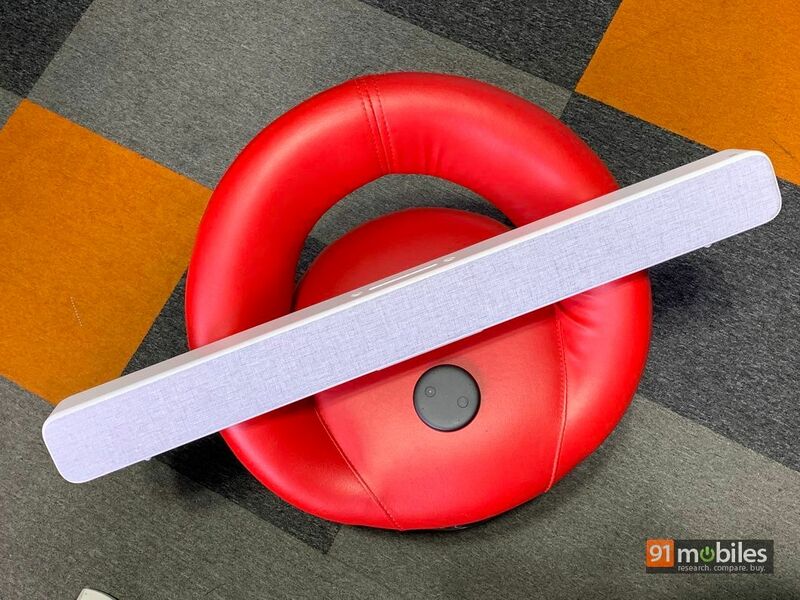 The latter can also make any dumb speaker smart, just like the Echo Input, but for the additional outlay of Rs 1,500, also gives you a basic built-in speaker. And unlike the Input, the Dot can also be used standalone. That said, the advantage of the Input is its smaller footprint, apart from the lower cost. So if you just want to add Alexa smarts to an existing speaker or home theatre system, the Echo Input is a wise choice. Not just that, I think the Input should also make for an interesting and useful in-car accessory for playing music… at least till the time the Echo Auto lands in India. Heading the editorial shenanigans at the Gurgaon headquarters, Deepak is gadget freak like no other. He’s been writing on technology for over 14 years, having worked at Digit Magazine, T3 and Engadget, to name a few. Known to switch his primary phone every three to four days, he's looking to own 91 mobile phones so he can justify his position as editor of 91mobiles. He’s usually reviewing the latest smartphone or tablet, and always has a good idea for a feature. His other responsibilities include being the voice of calm among an unruly bunch of writers.